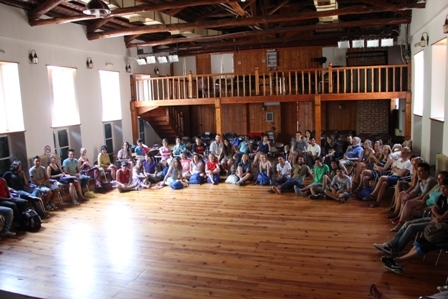 The Summer School is hosted at ‘Polykentro’, a heritage building at the heart of the historic town of Plomari. Polykentro, a former soap-factory, functions today as the cultural centre of the town. It consists of a small museum exhibiting traditional techniques of soap-making (downstairs) and a theatre/lecture room (upstairs) accompanied by a sitting area with a bar. A wi-fi connection is available at Polykentro and participants often find it useful to bring their own laptops. At the sitting area, participants are given access to a computer connected to a printer. As Polykentro is situated at the centre of the town, there is easy access to a photocopying centre, shops, supermarket, bank, etc.